Participants who donate cans and pantry items are not only contributing to an important cause, but may also win fantastic prizes. Help us reach our goal of 300 items! After two weeks, we will deliver all donations to the Pacifica Resource center. The Pacifica Resource Center continues to be an integral part of our local community­ by providing food, housing support, and other critical services to our Pacifica neighbors in need. Let’s come together and support this important and necessary cause. The Donation drive runs from April 1-14. 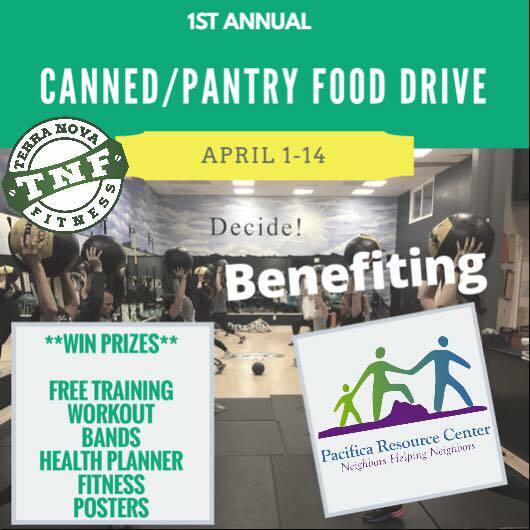 To take part, simply bring one or more cans or pantry items into Terra Nova Fitness at 1007 Terra Nova Blvd, Pacifica, CA, 94044. Monday between 6-10am, 4-8pm and Saturday 8-11am.